..as I’ve just received confirmation of my place in the July Assessment event. Think I’ve decided to go for a CD submission of my assignments supported by selected prints from each. My blog will be supported by a clippings file and a written log book this time as well (although the latter is a little less padded than it could be because I cottoned on to its value a bit late in the day). A couple of people on Flickr have recently asked me where I’m going with my night time shots – both the black and whites and the sodium/tungsten lighting shots. In all honesty I’m not fully sure – there seems to be something there that’s a bit beyond my grasp at the moment. My response has been to keep taking the shots and as I said in response to one of the comments try to extract a thread. I take this to mean that our perception of space is related to our memory – we’re seeing lots of individual “shots” of the scene and our brain/memory is piecing them together to make a whole. It was this he was pursuing in his multi-point perspective ‘joiners’ when he was experimenting with photography. To me there feels to be more to it than this. When I remember a place – or the sense of a place – I don’t remember it as a single image – even if it’s really remarkable. Of all the places I’ve visited Uluru is my favourite – but I don’t remember a single image of it – more a collection of images that build up to form my memory. So where does that take me? How do we use photography to create both a sense of space, and a permanent ‘memory’ (as opposed to image) of a place – in other words a genuine sense of space and place? For the record all the shots were taken at ISO1600 on an an E-P1 with a 17mm lens. Post processing was generally limited to the crop although in a couple I adjusted the contrast with curves in Lightroom to deepen the blacks, one (the car park) had a sight colour balance adjustment and a in a couple I brightened the red and orange channels a little to bring the colours back after the contrast adjustment. 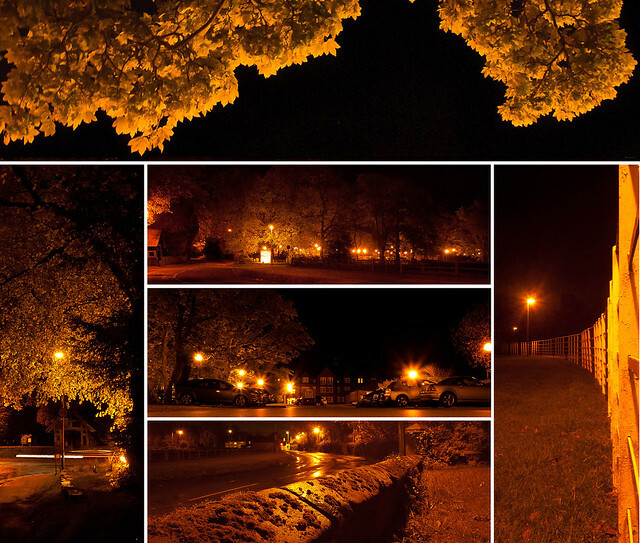 As a first attempt this feels to work quite well – the lines leading into the picture combine with the ‘flatter’ images to to provide a sense of volume, and the pictures work reasonably well together to give an idea of what you might find there and the sense of otherworldly lighting from the multiple artificial light sources is conveyed fairly well. The absence of a shot across the bottom also seems to emphasise a sense of being ‘under the trees’. This has me wondering if I shouldn’t investigate the images of Uluru in my computer memory to see if I can produce a similar image to match my real memory. I’d be interested to know what anyone else thinks. 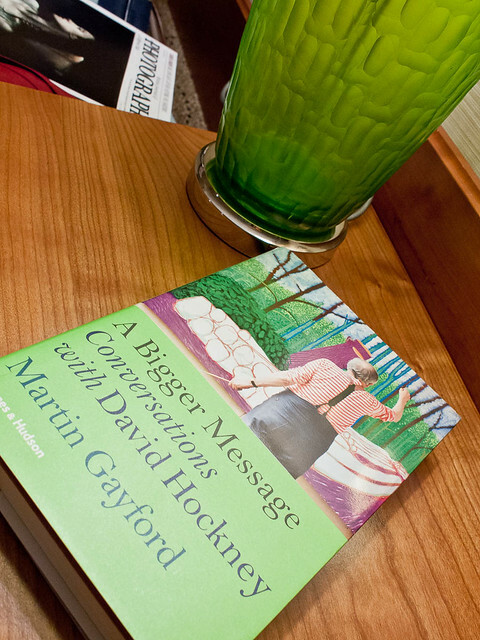 Martin Gayford is an art critic and, on the basis of this book, appears to be quite a close friend of David Hockney’s. In this book he has captured a series of conversations with Hockney about many different aspects of art – including photography. I picked it up because I’ve had an interest in Hockney’s stuff since seeing ‘Bigger Trees near Warter’ at the art museum in York about a year ago. A key theme is perspective and the creation of space in images. He clearly feels that the single point perspective of a camera does not do this very effectively – his collages of the late ‘70s/early ‘80s are a testament to his experiments with this – he regards them as more akin to drawing than photography because they do not restrict the artist to a single viewpoint. On a related note his ‘non-panorama’ of 25 trees which he has joined using painting/drawing techniques reflects his take on scrolls as a stationary movie, and there is an interesting section on the use of isometric (rather than vanishing point) perspective in Chinese scrolls. He feels that it’s not possible to take a good photo of the Grand Canyon because you lose the sense of space – it might be interesting to review some of Ansel Adam’s shots with this thought in mind. Another key theme is the importance of seeing, rather than just looking , in art. Chunks of this were about draughtsmanship and the benefit of painting from memory after properly studying a subject. On a more philosophical bent, there were interesting discussions on photography and their perception as reality – which they aren’t. As he observed – this is not an issue for painting. There’s lots more – he has some interesting views, with solid, if circumstantial evidence, on the use of pinhole cameras/camera obscura in Renaissance art, based in part on the odd perspectives we find in some of these images. He also has an interesting chapter or two on using the i-phone/i-pad for drawing. In particular , because it is always with him it provides opportunities for quick ‘paintings’ of almost anything – his feet, an ashtray, his cap, whatever takes his fancy. He feels this to be a new development – although I can see some parallels with small cameras and photo-a-day. Some of these discussions are cut down versions of some of the stuff in Sontag, and to a lesser extent, Barthes, but to me they have the real advantage that they are discussed in the light of experience. All in all I can’t recommend this book highly enough. I suspect it will be a regular colleague as I move on to Landscape 2. My last week has been absorbed with stage crewing for a production of Cinderella at the local community centre/village hall. Under other circumstances I guess it might have provided lots of opportunities for theatre photography, but if you’ve never done it stage crewing requires a bit of concentration so I didn’t really want the distraction. HOWEVER – I did take my camera along to the dress rehearsal and just before kick-off I took this shot. I was trying to catch something of the sense of anticipation – which hopefully I’ve achieved. Why post it here? Because for me it exemplifies some of the things that I have taken from this (and the previous) course. I’ve chosen the view point and crop deliberately to emphasise the importance of the stage, in a way that I don’t believe I would have done before – and I’ve included a person. Even if I had chosen to do this shot previously, prior to this course I would have asked the guy on stage to move – or waited for him to step out of shot. I considered this time, but then decided to leave him in because without a person the shot is just empty. As it is I think it raises a number of questions about what is actually happening. What is he doing? Why are all the seats empty? To me this feels like a step in the right direction. Just realised I have not posted anything in response to this. In this assignment, you have shown you can adapt your technique to suit the occasion. Mixed lighting is always a challenge and you have approached this task very sensibly by careful planning, the choice of equipment, the best angle of view to adopt and the types of shots to record to fulfil the brief given. I believe you have approached and fulfilled the assignment given in a competent manner and provided your client with some telling and expressive images that are strong in colour and content. This is obviously a pleasing result for me, especially coupled with the feedback from Assignment 4 which suggests I’ve learned the lessons from Assignment 3. I put a lot of additional effort into preparing the submission for this, and the previous two assignments. This is perhaps a key learning point for me through this course – I need to explain what I am doing and why. Ultimately the end result must speak for itself, but I need to be able to demonstrate that it was not achieved by luck, and that the course is having some impact on the way in which I am developing – indeed that I am actually developing. My tutor did have some reservations about the draft design of the brochures. I am comfortable with this – I will be submitting them to support the assignment, rather than as the outcome. The primary submission will be the dozen shots that I sent to my tutor. Visited the exhibition from Competition 5 which is at Rheged, just outside Penrith until 30 June, before moving off to Portugal and then returning to England in September time. Not sure if most of it was really garden photography - quite a lot of wildlife shots, still lifes, woodlands etc - so the title is a bit misleading. The exhibition was nicely laid out, and there was plenty of space to stand and stare. They were still waiting for the catlogues when I visited , but the link to the website covers that angle. Overall I thought the pictures were technically excellent - as you might expect - but were often quite sterile. Once you got past the 'Ooh! That's pretty/cute/funny' reaction there was nowhere else to go. A classic example was a grasshopper wiping dew from its forehead - it is undoubtedly a very well captured moment that required some quick reactions and had a real slapstick quality to it - but where does it go after that? By way of a contrast the overall winner, at least in my mind, raises all sorts of questions about the interrelationship of the various bits of the natural world and their fragility. I'm only going to post one more link - my favourite shot of the exhibition - as it's worth either visiting the website or - if you're in the Lakes this spring - getting along to see it. The web image doesn't really do justice to my favourite - in the exhibition its a very large print and the sunlight on the small patch of toadstools simply glows. To me it speaks of rebirth and the circle of life and I stood in front of it just lost for quite a while. It shows the value of really understanding the area you are photographing in and probably falls under the category of 'the harder I work the luckier I get'. A couple of oddities worth a mention - a series of X-ray shots of seed heads featured in the prize winners, although I couldn't fathom why, and there was an eerie series of flowers/leaves slowly decaying in jars of water to produce fascinating and delicate semi-abstracts. So my advice is - see it if you get a chance. If not, have a look on the website. As for me - I pondering an entry in the next competition. Not really about People and Place, but the photos in the link show a clever use of black to provide not only a linking theme but also a clear style to a set of photos. I particularly like the way that the majority of the photo is effectively negative space - almost inverting the concept (at least as I understand it) in some ways. The My Modern Metropolis site also looks worthy of further exploration in general.